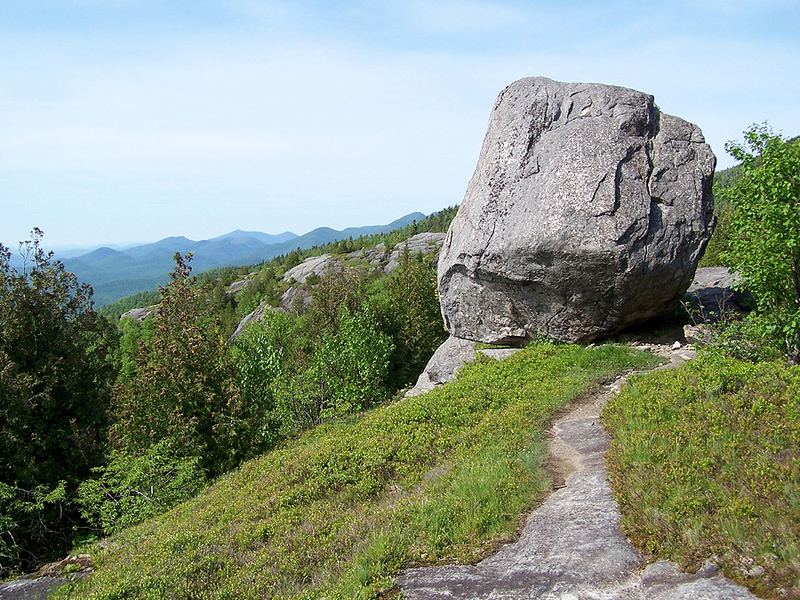 - One of the most scenic hikes in the Adirondacks is a traverse along Rocky Peak Ridge, most hikers will spot a car at the Giant Mountain Wilderness trailhead off Route 73 or the trailhead in New Russia off Route 9 and hike it in either direction. I figured since it was such a nice day out I would park in New Russia and hike all the way to Giant Mountain then turn back and do it again. 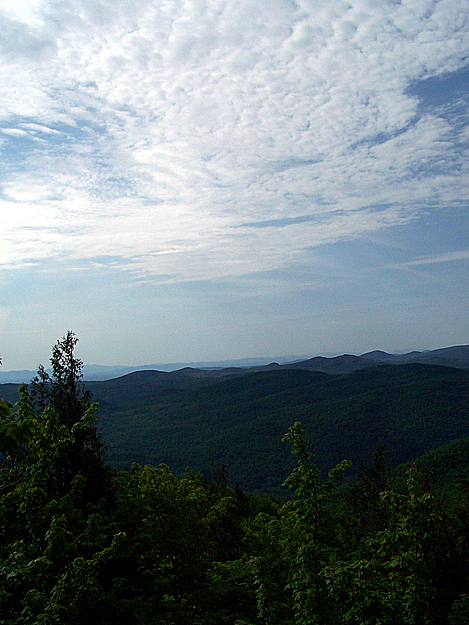 - Over the first four miles the East Trail passes over a bunch of small peaks (Blueberry Cobbles, Mason, Bald Peak) with some really nice views east into Vermont and west to the Dix Range. I could see Vermont's highest peak, Mount Mansfield, and it's profile with the 'nose' and 'chin' under an early morning haze. - The East Trail is one of the more enjoyable and dryer trails in the ADK's, there is not much mud and the trail has only one long continuous uphill section in the woods which is between Bald Peak and Rocky Peak. 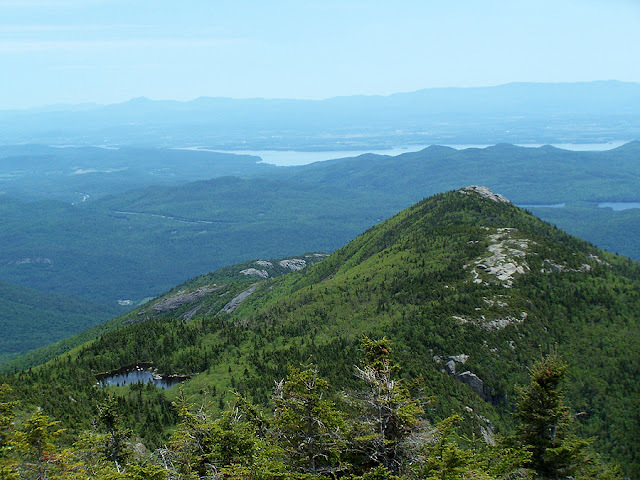 - Between Rocky Peak and Rocky Peak Ridge (yes the names are almost identical) the hiking is out in the open passing by Marie Louise Pond and ascending the open ridge to the Rocky Peak Ridge's summit. 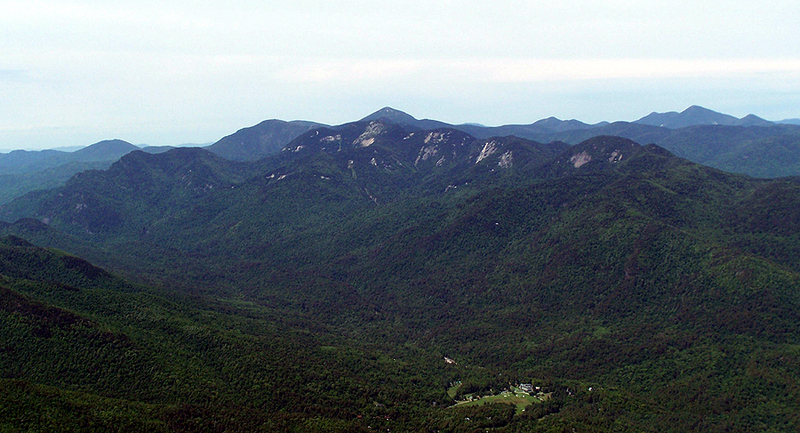 Views from Rocky Peak Ridge would be the best if it was not for Giant Mountain looming large to the west. - The hike over to Giant Mountain is not the usual 1.3 miles between 4,000 foot peaks, it is almost like hiking between some of the Great Range 4,000 footers with a steep descent and ascent between peaks. - Luckily I have done this part before so I knew what was ahead of me and it actually went faster than what I thought it would take, it also helped that I was finally running into other hikers so I could take a quick break to chat with before motoring up to Giant. - Giant Mountain's summit has an incredible view of the Great Range, Dix Range, Sawteeth, etc. I took a nice break here to have lunch and enjoy the views before it was time to head all the way back to New Russia. - The only difficult part of heading east over the East Trail is leaving Giant and having to drop down and then head back up to Rocky Peak Ridge. I find that from the Giant/RPR col heading up Rocky Peak Ridge is easier than heading up Giant Mountain so it wasn't that bad and I made good time. - I was back on Rocky Peak Ridge's summit just after noon and still had 6.3 miles to go, almost all of which was downhill, and from here on out I would not see another person all day. - The wind started to pick up around Bald Peak and the clouds were turning darker but the weather held up and I still had great views all the way back to my car. - It was a great hike, one that I recommend doing with a car spot and definitely do it east to west to get all the elevation gain out in the beginning. We had done what you suggested using a car spot. We went on 10/10/11 during the perfect Columbus Day weather weekend, only instead of going to Giant and back, we spotted a car and continued over Hopkins, which is also a great peak. It was a wonderful trip overall. Nice trip report and great pictures as usual. Thanks Telemarkmike, glad you liked the pics and report. I will definitely try to head over to Hopkins one of these days, sound slike you guys had a great hike. Columbus Day Weekend last year in the ADK's was phenomenal!! Chris, your hikes are consistently beyond awesome! I know I'm in for a treat each time I see that you've posted a new hike. Thanks John, that means a lot coming from you since you go on so many cool hiking trips deep into the woods and always take great pictures with detailed reports!